Hey y’all! 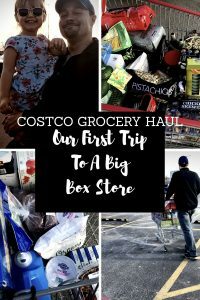 This is the story of our first big box store trip! Today, I’m gonna show ya what we got at Costco last weekend. 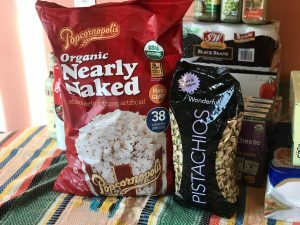 I apologize if this doesn’t interest you, but I’ve gotten a lot of requests over the past couple of years to show ya some grocery hauls. I’ve never done it truthfully because I just find it to be kind of a lot of work and I’d rather be cooking if I’m photographing food. haha! I’m also usually scrambling to shove groceries in different places and make it look at least half organized. I’m trying to get better about keeping my pantry organized because I am coming to the realization that the kitchen is basically my office. You know? I “work” and create in there almost on a daily basis so it needs to be kinda sorta organized. 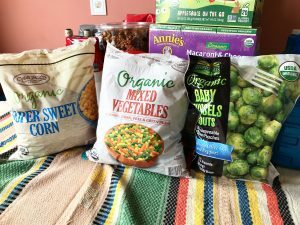 Anyhow, While we were shopping at Costco I kind of thought maybe this would be an easyish grocery haul to photograph and write about since most things are in a nice big package and there’s not going to be 234 items in random bags. You know? I took a poll over on Instagram and I think about 3,000 of ya wanted me to do this and there were maybe 120 that didn’t want it. So, if you’re here and you’re apart of that 120 then I’m sorry. I’ll get some recipes posted a-sap. I just needed to take a tiny break from recipe writing after last weeks Chicken Burrito Bowl series of posts. Let’s get down to what ya’ll stopped by here for! Alright, here’s the thing I decided to go into this stocking up on things I use when I am cooking A LOT. I had no idea what to expect. We live an hour and a half away from a Costco so that’s the biggest reason we’ve never gone to one. I didn’t ask for any recommendations. I just made a list of things I’d like to get and I went from there. They didn’t carry a good handful of items that were on my list which I was personally kind of bummed about. But, it also could be that I just didn’t see them. I was kind of overwhelmed. Costco can be kind of an overwhelming place. It’s not for the faint of heart. Haha, totally kidding. It’s like a freakin’ adult playground and everyone should go. NOW. Tomato stuff– tomato sauce, diced tomatoes, and approximately 106 ounces of San Marzano Italian whole tomatoes. I’m planning on making a HUGE batch of my “Almost Famous” Marinara with that big ol’ can of San Marzano tomatoes. 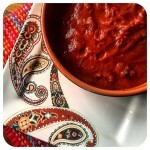 When I started making this sauce I used just about any type/brand of canned tomatoes. So, I’m not telling you to go out and buy fancy italian tomatoes. I’m really not. 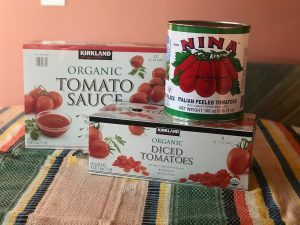 I was watching Food Network one day a few months ago and these two chefs wouldn’t stop going on about how good these canned San Marzano tomatoes are and yada yada.. so I grabbed a few big cans at the store and made sauce with them awhile back. It took the sauce to next level deliciousness. It really did. I honestly couldn’t believe it! So anyway, what I’m getting at is the tomatoes that I normally get these days are about 3.99 per 28 ounce can (WELL WORTH IT!! ), BUT I FOUND A 106 OUNCE CAN OF SAN MARZANO TOMATOES FOR $3.69. I’m a little ticked I didn’t buy like 70 cans, but truthfully. They are huge cans and I have no idea where I’d put them. Costco is the kind of place where you have to draw yourself a line and you can’t step over it. 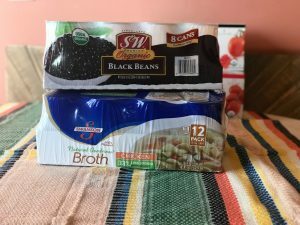 Beans & Broth– I eat black beans a lot since I made the decision to actually like the dang things! (especially now that they are zero points on Freestyle!) I also have incorporated them into a ton’a recipes. 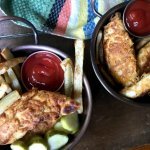 My favorite recipes with black beans at the moment: Southwest Egg Rolls & Skinny Southwest Dip! I’m also known to switch pinto beans for black beans in recipes like my Chili Cheese Spaghetti Bake & Cowboy’s Meal ! Worcestershire Sauce- Least favorite word to spell in the history of mankind, but it’s my favorite “secret” ingredient that’s not so secret anymore. I use it as a flavor booster in so many of my recipes and I have for so many years. It has and always will be one of my go to ingredients so why not have two gigantic bottles of it on hand? Lea & Perrins is also my go to brand. I feel the pictures here don’t do it justice. These things don’t look giant, but they really are. Haha! Cooking spray- Another “Why the heck don’t I need two gigantic things of it! ?” I use it daily. I do prefer olive oil spray, but I’m not super picky. I didn’t see olive oil spray which I was kinda sad about. I should probably just buy a Misto (is that what that things called?) and a giant bottle of olive oil. Yeah, why don’t I just do that? Spices- Y’all, the spices alone are worth a trip to Costco. I didn’t take inventory of my spices because I didn’t think of it so I didn’t stock up on much which I am sorely regretting, but I am still mind boggled by this one. I use spices a lot and I go through them like crazy. See that Cumin? It’s easily one of my most used spices. I buy a 1.4 ounce container of cumin probably once a month for $5.99. Want to know how much that giant container of Cumin is? I think its 14 ounces and it was $4.99. Can you deal with that? because I still can’t. Spice Islands is one of my favorite spice brands too. I’m just completely mind boggled about the spices. If you’re an avid cook like me. STOCK UP ON THE SPICES!! I already can’t wait to go back to just get every other spice in the world. Applesauce “squeezies”- These are for Pepper. She loves them! Another great buy. I think these were 10 bucks, maybe 12 for 20 of’m! I think the four packs are normally $3.99 at a regular grocery store. 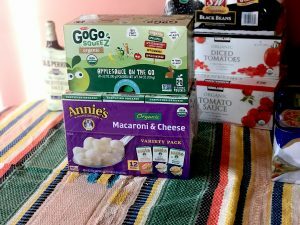 Annies Mac & Cheese– Yep, I’m a food blogger and I make my kid boxed mac & cheese. Guilty as charged! These lil boxes of cheesy goodness are a LIFESAVER. Sometimes, It’s all she wants to eat. Sometimes, It’s all I feel like making. If I have one tip for parenting it’s.. MAC AND CHEESE. So, why not buy 12 boxes of it? COFFEE, COFFEE, COFFEE- 6 POUNDS OF COFFEE!!! Eric and I love our morning coffee a whole bunch. We have the type of relationship where we sometimes have to apologize to each other for what we said before we’ve had our morning coffee. Coffee makes us work. There are days I think about giving it up and then I laugh about that. Anyway, homemade cold brew season is coming which means I need A LOT of freshly ground coffee for every batch I make. This was definitely a good buy, but we can be kind of coffee snobs. I hope it’s good. I will update this part of the post once we’ve we’ve tried it. It hasn’t been opened yet. 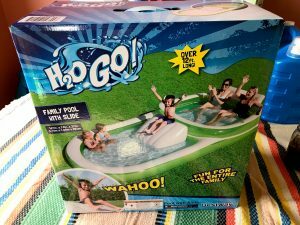 The “Eric wanders off alone with his own cart” part of the haul– Seriously? This popcorn is my gol’dang kryptonite. I’m making him keep it in his truck because I can’t even be in the same room as it without gaining a pound. The bags are literally almost as tall as Pepper. Also, who doesn’t need 4 pounds of jelly beans? *insert eye roll* Note to self: do not leave him unattended at Costco. Haha!! Pistachios- It was hard NOT to buy these. We LOVE pistachios, but I can’t deal with the prices of them. A teeny tiny bag with like 12 nuts is like 4.99. This bag was 12 bucks, YA’LL. When we go back again in a couple months I’ll definitely take a better look at all different nuts and probably stock up on some. This was towards the end of our shopping trip and my brain was hurting and Pepper was gettin’ ancy. It was time for us to go! Granola- Another thing Eric threw in his cart. It’s DELICIOUS! It’s in the bakery section. It’s addictive. Don’t buy it unless you have massive amounts of self control. I’m not sure if you’re interested in nonfood items. I’ll just group them all together real quick. Laundry detergent- Great buy! I think this was 11 bucks, maybe? Kitchen bags- Do you want to know what I hate spending money on most? Garbage bags. I’m literally paying for something to throw away. And, you can’t really cheap out on them either or they will break and spill garbage all over the floor and then you’ll be yelling at the dogs to stop eating old banana peels, and cursing as you spray cleaning product all over the floor. (This totally didn’t happen in real life….) Anyway, I just hope these are good bags because it’s a ton’a them for a good price. Baby wipes- I’ve been using these for Pepper and they’ve been nice! 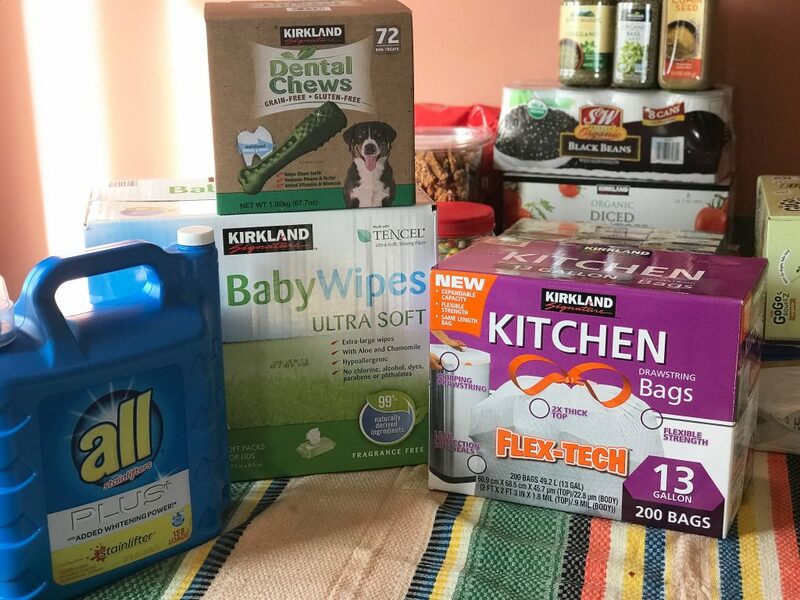 Wipes are a necessity when you’re a parent and we’ve probably spent 2,543 dollars on packages of’m already might as well save a few bucks! Dog Dental Chews- These things are pricey. We normally get the name brand packs from our local pet supply shop, but figured we’d give these a shot for our two beloved mutts who have the stinkiest breath this side of the Mississippi. As far prices go… You get almost triple, I believe, for the same price. We’ll see how they do with the dogs breath though because honestly, that’s really all that matters. I’ll update this part after the dogs have had them for a couple weeks! 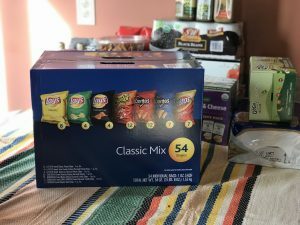 Assorted chips- These are great to have on hand at all times for Eric. He grabs them for his lunches daily. These are also great to have on hand instead of big bags of chips because if I do get into the chips I’m only going to do a little damage. If I eat the whole bag… it’s only a small bag. Organic milk- We only drink organic milk in this house. I don’t wanna sound snobby or anything because I’m not, but it’s just something I insist on. I read something once and now it’s apart of my life. As you can imagine, it can get expensive. So I was super excited to find 1.5 gallons for 10 bucks. This is another item that I would have bought a lot more of if I had the room. Organic milk actually lasts longer than non organic milk as long as it’s not opened. Weird, huh? I think it has something to do with the pasteurization process. I can’t remember. I also use 1% milk in most of the recipes that I make and create. Organic butter- I can’t remember the price of this and I can’t find it on the receipt, but I know it was an absolute amazing price for organic butter. I don’t use a lot of butter in recipes, but I do use it. There’s not much better than a bit of real butter. Those two packages will last us for months and butter is freezer friendly too! 0% Plain Greek Yogurt- These are two VERY large containers and they are cheaper than one of the large sized container from my regular grocery store. I couldn’t not get them. 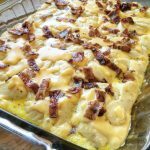 I’ll be making a bunch of two ingredient dough pizza, garlic parm drop biscuits, southwest chipotle ranch, and bacon, egg, and cheese biscuits with’m! String cheese- A serious staple in our home. 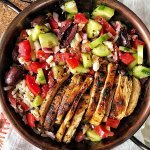 Mediterranean Chicken Skewers- If you haven’t tried these, TRY THEM! They are super delicious. They’ve actually inspired me to make my own greek chicken, greek smashed taters, and a tomato cucumber salad. (You’ll find those on the blog soon!) The skewers seem like they would be such an awesome item to have on hand for a really quick & healthy meal. I was worried I wouldn’t like them so I only got one package and I wish I would have gotten like five! They are found in the refrigerated section, but you can freeze them. A very good buy and super point/calorie friendly! 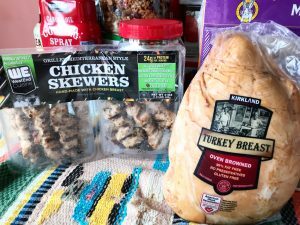 99% Fat Free Turkey Breast, fully cooked– Hands down some of the best turkey I’ve ever had. The prices range per pound, but it’s definitely bang for your buck. I’ve used this for sandwiches, in salads, and plan to use it in my Turkey Cheddar Broccoli Stuffed Taters I have to say this might be a MUST have. It’s so yummy and ZERO points if you’re doing Weight Watchers Freestyle. 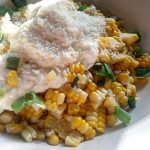 Frozen veggies- I use a lot of frozen corn and a lot of frozen mixed veggies in recipes so I figured this was a must buy. The bonus was that they were organic and a really, really good price! The brussels sprouts are actually for Eric. I like brussels sprouts, but only fresh (and charred). 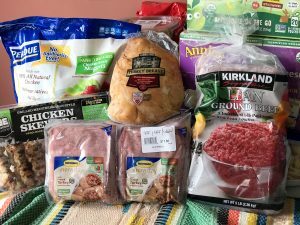 Lean ground turkey- Another thing that I use A LOT of. 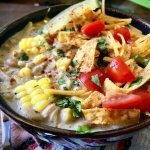 A few of my favorite recipes? One Pot Spaghetti, Crockpot Lasagna, Stuffed Pepper Soup, and Slow Cooker Italian Turkey Meatballs I truly don’t really use the 99% fat free ground turkey a lot so it’s not something I felt that I needed to stock up. 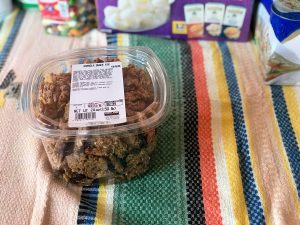 Lean ground Beef- I wasn’t super excited that this was in the frozen aisle, but they didn’t have fresh lean ground beef. It was pretty good though. 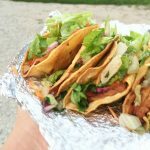 We had it in tacos last night! Great price too, lean ground beef is normally around 4.50 a lb in my area. This was 5 lbs for $18! 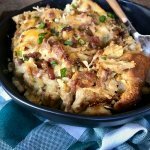 Some of my favorite recipes using lean ground beef: Cowboy’s Meal, Poor Man’s Meal, Italian Sloppy Joes, and Cheesy Italian Rice Skillet to name a handful. Chicken nuggets- Sometimes ya just need some chicken nuggets. These are for both Pep and me because mama loves her nuggets too! 6 lbs for 10 bucks, sign me up forever! 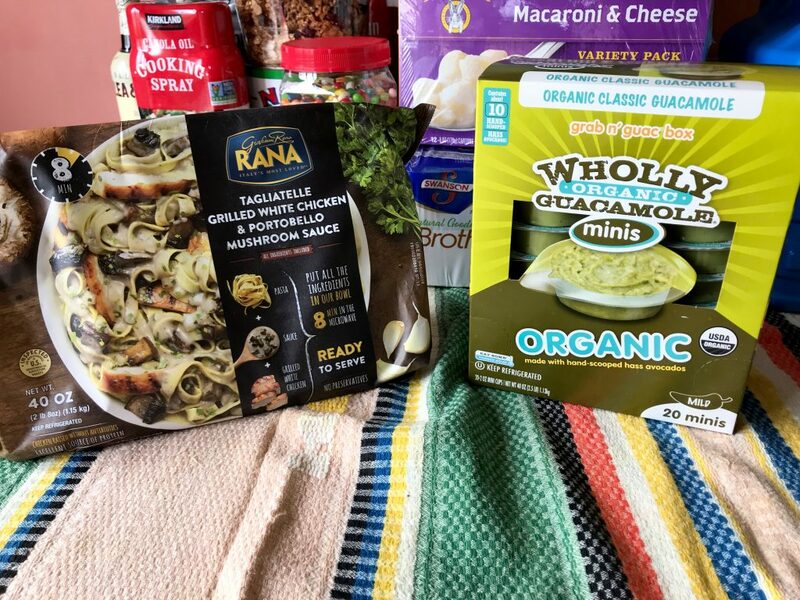 Rana Fresh Pasta Meal Kit- Another Eric find. It has a Portobello mushroom sauce so he got it for himself because I’m a meanie and never make anything with mushrooms. Haha! Guacamole- I love guacamole SO much, but I truly don’t make it homemade that often because I feel like I overeat it badly because it will get brown and gross in the fridge. I do make it from time to time, but honestly buying these little packs has been one of the most amazing things ever. I LOVE THEM! Although I haven’t tried it yet. I read on the box that they are freezer friendly. So we will see how that goes. I’ll pop a few in the freezer if it’s getting close to the expiration date and there is leftovers. Because who doesn’t need a giant inflatable pool? Oh, Costco! Haha! (Also, this thrown in while Eric was off by himself…) He’s such a big kid. I just love that man. I am really looking forward to going again in a couple of months and having a better idea of what to expect. I am bummed that I couldn’t find a good handful of things that I really wanted to compare prices and stock up on. I think I might try to go by myself next time so I don’t have any distraction. Haha! 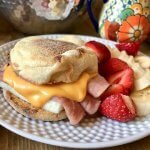 It’s a huge, awesome place, and it’s totally a playground for someone like me who runs a food blog, is an avid cook, and loves getting the most bang for my buck! Let me know if y’all want me to post again when I go in a couple months. Also, let me know if ya have any questions about the items and I’ll try my best to give ya an answer! Now, please leave a comment below and let me know YOUR favorite Costco finds! Did I miss anything real good? Tell me! We have been Costco fans for awhile now and we stock up when we go! The non-edible items we buy there are paper plates, toilet paper, paper towels and batteries! They are a MUST! I always look at their sales too and base my shopping around that from time-to-time. My littles love a granola bar so I will stock up on those there, their gummy snacks and other snacks. -When they have them, KODIAK CAKES! Ridiculously great price. -BANANAS — 1.39 for a bunch. STUPID cheap! -Strawberries were really cheap this past trip – they were huge and SWEET! That’s just a few — honestly.. you can’t go wrong with Costco products! I’m a guy and although I do love to eat (and even cook! 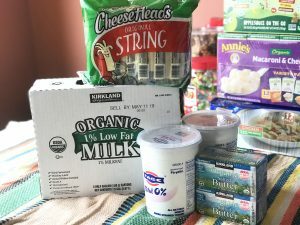 ), I’ll point out a few non-food items we get at Costco: batteries, toilet paper, computer paper, printer ink cartridges, TurboTax, underwear, socks, seasonal clothes like sandals, shorts, shirts. Car batteries, car tires (not available at every Costco), household tools such as screwdrivers and wrenches, light bulbs, electronics (everything from the computer I’m using now, to SD cars, flash drives, and all the cell phones my family uses), alcoholic beverages, Christmas decoration and gifts, bed sheets, pillows. I could go on and on. In general, I hate shopping, but Costco is the one store I actually enjoy going to. Thanks for letting me know, David! Eric will LOVE this list. He loathes shopping, but he was like a kid in candy land at Costco. Haha! We didn’t even make it to the non food items last time so I am excited to go again and get into the other part of the store. Ready cooked cut up rotisserie chicken. It is such a time saver! I shop more at Costco than any where else and I am only shopping for 2 people!!! I buy all of my greens/tomatoes/potatoes/onions/avocadoes/celery/mini peppers/cucumbers/fresh broccoli/cauliflower/mushrooms. The prices are so much cheaper than our grocery store. I feel like even if I have to feed some to the chickens I’m still saving money over the grocery store! Their meat is phenomenal. I will not buy any other albacore tuna. Cheese & nut prices are awesome. They have a artichoke/jalapeno dip that is very good. Their pesto is good, too. You can’t make your own for any less. Best price on chips. We love the Food Should Taste So Good Tortilla chips. They are GF. 10 Chips are 4 SP. The chips are big and so worth the 4 SP to me. Their Kirkland brand canned goods are very good. Almost all the frozen fruits/veggies are organic and very good. The 1% organic milk last a long time. I noticed milk in paper boxes last longer that the ones in the plastic container. You can find good deals on books, magazines, kids clothes, socks, t-shirts, bath towels, sheet sets . . . . . We are switching all of our light bulbs to led’s. We got some good deals at Costco for this. We buy our glasses/contacts there, too! Someone mentioned the mini wontons. They are delish and low in SP’s. I buy my non-stick skillets there as well. I love their return policy. Unless it’s an electronic item you can return the item any time for a full refund. We had a lawn mower that the pull cord broke on. We hosed off the mower, emptied the gas and took it back. They asked if we wanted cash back or a Costco cash card. We had the mower 3 years! We took the money and put it towards another mower. I should work for them! haha. Love, love, love me some Costco. Don’t forget the Jarlsberg lite cheese. Great price for a package of 2. Also 1sp a slice! The Colombian coffee is awesome. It is the best price for a delicious coffee. 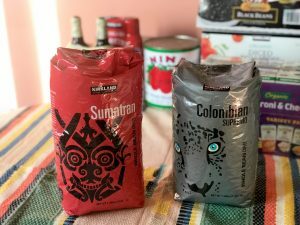 Hubby and I love coffee so much that we will buy two of them! I also get the Kirkland Almond Milk. Since I make smoothies alot, it is the perfect price for the 6 pack. -rotisserie chicken for $5- I usually pick one up to eat the day I do all my shopping because I never want to cook when I get home from shopping, driving home, and putting everything away. -Kirkland detergent: it is just as good as Tide, but about half the price. It also goes on coupon every other month or so for about $3 off, same with the fabric softener. -Kodiak Cakes $11 for 4.5 lbs at my store. -Laughing Cow cheese and Babybel light cheese are stupid cheep, especially during coupons. 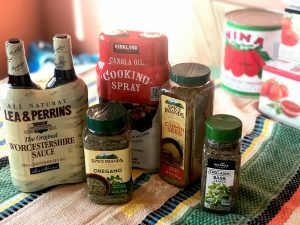 -Kirkland organic no salt seasoning: it has so many wonderful dehydrated spices and veggies in it, read the ingredient list on the back! I add it to just about everything! -They usually have a 2 pack of Misto-s for super cheep, I think they’d tend to show up around September, but I do love the Kirkland spray as well. And I have switched to ground turkey, but they should have had fresh, lean ground beef, I am pretty sure it is 90/10, maybe they were out, but they have it in ~5lb trays and some that are in massive patty shapes. I love how clean everything is in all of the fresh areas. It is something Costco takes very seriously which is why they have all the windows set up for you to see inside. It gives me incredible peace of mind. And don’t forget you can return anything you don’t like. Sorry I went on forever, but I really have a special place in my heart for Costco. They don’t ALWAYS carry them but Crepini Crepes! I think 1 SP for 1 crepe and 3 SPs for 2! Super versatile, used them for sweet (fresh fruit and a little whipped cream) and savory. (Ham and some light Swiss). Preference is always a homemade crepe but they’re still great in a pinch! I find that the organic milk is not a good deal. I can get 2 gallons of organic milk at the grocery store for 5.99 and 1.5 gallons at costco is 11.99. So I’m not sure what you’re milk prices are but that is one place where I find you don’t get a savings. Also, their kirkland peanut butter is excellent as is the almond butter. Organic milk is expensive where I live. Maybe because I’m in a small town? not sure. But, the 1% organic half gallons are $4.18 and the Kirkland organic milk was 9.99 for 1.5 gals. Maybe it was on special?! I will grab peanut butter and almond butter next time. I didn’t even think of that! Thanks for your info! I love Costco and Aldi’s my 2 go to stores. Costco musts are coffee toliet paper and shrimp and of course Kerry Gold Butter. The white Albacore cans of Tuna are the best ever. And all my magazines I love 30% off. I almost got tuna! I am ticked I didn’t get it. I’ll have to check out the magazines and I’m so bummed I didn’t get kerrygold. I must have looked right over it! I love the already shelled pistachios that are the Costco brand for $12.99 such a steal and so delicious! The cilantro chicken mini wontons are one of my go to’s. I think the huge bag is 4.99, quadruple the amount of the Trader Joe’s and taste exactly the same. We LOVE Costco! My husband also does the exact same thing your husband did… just wanders off and comes back with all kinds of things we probably didn’t need! I think the Kirkland brand is just as good, if not better than name brand stuff, with one exception: facial tissues! Do yourself (and your nose) a favor and buy the real-deal Kleenex. Trust me on this. Otherwise, we always buy the garbage bags, toilet paper, paper towel, even the Kirkland laundry detergent is great. And the coffee! You won’t be disappointed! 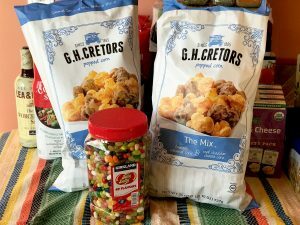 Other things we stock up on are: Annie’s fruit snacks and bunny Graham’s (for the toddler), bacon, frozen chicken breasts, cereal, English muffins (one pack for the counter and the rest in the freezer!) and I love the produce but you’re right, you have to be careful or else you end up with more than you can eat. Put your ripe avocados in the fridge to extend their life by at least 3-5 days. I also love the organic honeycrisp apples and they stay fresh in the fridge for a long time! My husband also LOVES the prepared chicken salad and I get the pack of 6 stuffed bell peppers and throw them in the freezer. 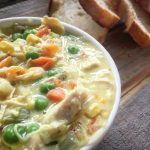 They are DELICIOUS and nice to have on hand when you don’t want or have time to cook dinner. Kerrygold Butter! From grassfed cows, it’s the BEST butter and the best price at Costco. Thank you for this! I’m a Costco shopper BUT I am also a shopper that goes in for what I need and I don’t look at anything else because let’s face it, on a Saturday, Costco can be intimidating. Now, I can’t wait to go and shop! Love this! I go to Sam’s instead of Costco, but they carry a lot of the same things. I get overwhelmed in there! My favorite thing to get is their fresh rotisserie chicken. It’s right by my house so I pick them up often and use it to make your chicken salad recipe or an easy dinner. I love those chicken skewers and would LOVE a recipe to make them on my own. We don’t have the San Marzano Tomatoes at out Costco. Wahhhhhhh! I think their organic milk is the BEST, and I only used Costco wipes on my kiddo. I thought they were awesome. Their diapers are the bomb, too. I recommend their fresh chicken breast and the Kirkland organic olive oil is very reasonably priced and works great in a misto! If you can find claussen pickle spears at your costco we also love those and they are ww friendly, the two near us in Illinois recently stopped carrying them though. I freeze the wholly Quac all the time. I add it to almost everything that I cook, especially soups. It gives a bit of flavour boost while also thickening things up. Also a great way to use the frozen extras. I will have to buy the tomatoes next time. We only live about 45 minutes from on so we go a couple times a month. Those chicken nuggets are really good. We like to buy produce there.